Kurt Komoda’s editor illustration for Issue 04 of Coilhouse. Tea and sympathy (and tentacles). Arsenic and old lace (and absinthe). Information, inspiration, infection! Morning, sinners! That’s Warren’s line, but then it’s a Warren kind of morning (the kind of morning that all Coilhouse readers should begin with a bottle of whiskey in hand.) Because this morning, and all week, we’re taking your questions and answers over on Whitechapel! Step right up, ask us anything your heart desires. There are a lot of different beakers bubbling in the CH lab that we probably can’t discuss directly… but we can hint! And we can certainly get into more general chat: Coilhouse’s history, our personal inspirations, magazine theory, internet curating, etc. We’re basically game to discuss whatever parts of the process you’d like to hear more about, and we’d love to ask you some questions as well! What periodicals do you read? What you think the future holds for mainstream print? For indie mags? For tastemaking blogs? For fringe/alternative culture in general? 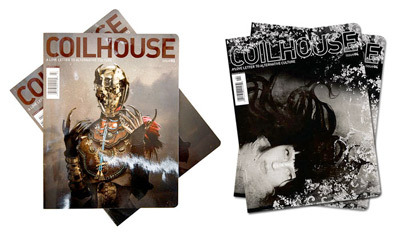 If you’re a Coilhouse reader, what subject matter would you be interested in seeing more of in our future issues? Down the rabbit hole we go. 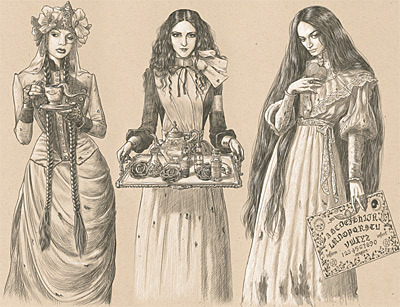 Let the Coilhouse/Whitechapel tea party commence! Additionally, this a courtesy post is to let all readers know that Issue 04 is almost gone. Issue 03 is walking out the door pretty fast as well (we had more 03’s in stock originally), but Issue 04 disappeared at an alarming pace that even we weren’t prepared for. 800 copies are gone since we put it up on sale on December 21, and 200 copies remain (with about as many copies left of Issue 03). So for any stragglers who were on the fence about buying one or both issues, now’s the time. Now or never, because we’re not in the position to reprint. Once they’re gone, they’re gone. This one’s pretty special to us, so we hope you get a copy. You can pick it up in our online store, at Wildilocks in Australia, Barnes & Noble and Borders in the US, and Meltdown Comics in Los Angeles. An exact list of store locations will be posted today or tomorrow. 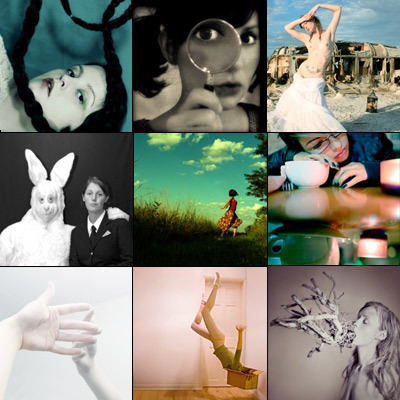 Top row: Caryn Drexl, Elle Moss, Katie West. Middle row: Hilary McHone, Diana Lemieux, Zoetica Ebb. Bottom row: Laura Kicey, Natalie Dybisz, Rebekka Guðleifsdóttir. Finally, there’s a self-portrait competition in the last days of voting with several members of the extended Coilhouse family in the running, as well as some talented folks we’ve not encountered before. The artist who wins the popular vote will receive a $1,000, and the grand prize is a residency in Manhattan. We’d like to urge you to support an artist by taking the time to view and vote for their portfolio. The contest’s site unhelpfully does not list a guide to the portfolios entered, so we’ve selected a few artists who we believe deserve your time. Photographers Caryn Drexl, Laura Kicey and Katie West should be familiar to anyone who’s read the blog long enough; our articles about their work appear at the bottom of this post. Additionally, our very own Zoetica has entered the contest with several phantasmagorical interpretations of reality. Other photographers whose work we found fascinating include Elle Moss, Hilary McHone, Diana Lemieux, Natalie Dybisz, and Rebekka Guðleifsdóttir. This list is by no means exhaustive, so if there are other entrants we should be aware of, please let us know in the comments! My first question is, who did the drawing of you three at the top of this post? Love it. Elana, whoops! I was just adding the byline as your question appeared. It was done by Kurt Komoda. Everyone else: please note that the Q&A is happening on Whitechapel. Make with the clickies, as Mer says, and see you there! Guys, seriously, all questions have to go to Whitechapel, but I’ll take this one here because it’s personal. After that, ALL QUESTIONS MUST GO TO WHITECHAPEL! Fritz, I never quite made it to London. The company that I worked for kept promising me to send me there (for years, actually), and they finally got me a work permit and threw me a goodbye party in LA and my bags were packed and my plane ticket was ordered and I was ready to go. I got an apartment in London, and the people in that office were waiting for me, and I was ready to start a new life. BUT, the day that I arrived there, that office was shut down due to the economy and everyone except for me was let go. I was relocated to San Francisco office, where I quit my job after a couple of months due to being too heartbroken over the entire thing. It’s been a bumpy ride, but I’ve started a new life here in San Francisco and it seems to be working out OK. Thanks for asking! Holy god. Glad you’re hanging in there. That portrait of the three of you is ridiculous. And by “ridiculous,” I mean “extra-great.” Really stunning. thank you for posting a link to my gallery in the competition! muchly appreciated. =) love you guys! That drawing of thee CH trinity is amazing. Now excuse me while I resurrect my Paypal solely for the purpose of getting my hands on the last of your artifacts. Yey! Looks like I got “no longer broke” just in time! I knew this would sell out quickly with everyone buzzing about it’s awesomeness. Figured I had at least till next month…guess not! That drawing really should be a print at some point. It’s too gorgeous for it not too…even if one has NO CLUE who it is, what it’s about, how it was used, etc. It stands on its own.